AMSTERDAM, The Netherlands, April 15, 2013 (ENS) – Four trekkers on a mission with Greenpeace International planted a flag on the seabed beneath the North Pole on Sunday. 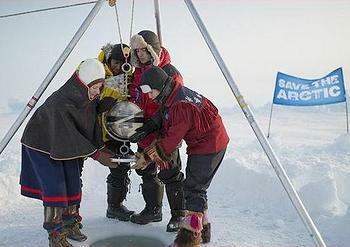 The flag is attached to a glass and titanium time capsule containing the names of 2.7 million people who joined the Greenpeace campaign to Save the Arctic. After a tough week-long trek across the frozen ocean, over giant pressure ridges and around pools of icy water with their support team, the four volunteers planted their “flag for the future” 4.3 kilometers (2.67 miles) beneath the ice. They called for the region to be declared a global sanctuary to protect the warming Arctic from industrial development, noting that they planted the environmental flag at the same place where a submarine planted a Russian flag claiming the Arctic in 2007. “We came to the Pole to say this special area of the Arctic belongs to no person and no nation, that it is the common heritage of everyone on Earth,” the four blogged from the North Pole. Although Shell Oil has withdrawn its plans to drill in Arctic waters in 2013 after a difficult 2012 drilling season, and ConocoPhillips and Norway’s Statoil say they will not drill there in 2014, Greenpeace is still concerned. Before lowering the pod, the four ambassadors held a ceremony at the top of the world, offering their wishes for the future, their dreams for a different tomorrow. “By creating a sanctuary we will take a symbolic first step towards redefining our relationship with Mother Earth,” Miller said. “We ask our leaders to recognize that climate change is upon us and to work together to fight it, for of us and for our children,” said Bijoux. In a blog post before setting out on the trek to the North Pole, Bijoux explained why he came from an archipelago in the Indian Ocean, some 1,500 kilometers (932 mi) east of mainland Africa to participate in this campaign. “Why do I care so much for the Arctic, you ask? Just come live a day in Seychelles, and you’ll understand. On my home island the temperature reaches up to 33 degrees Celsius and you can imagine how hot that is. There are even countries where the temperature is even higher! The Arctic helps in cooling the earth, thus making our lives much more bearable,” Bijoux wrote.